The Lightning and Bruins are currently previewing tonight what could be a very good playoff series next month, and going by this game, tempers will be hot if these teams meet again. 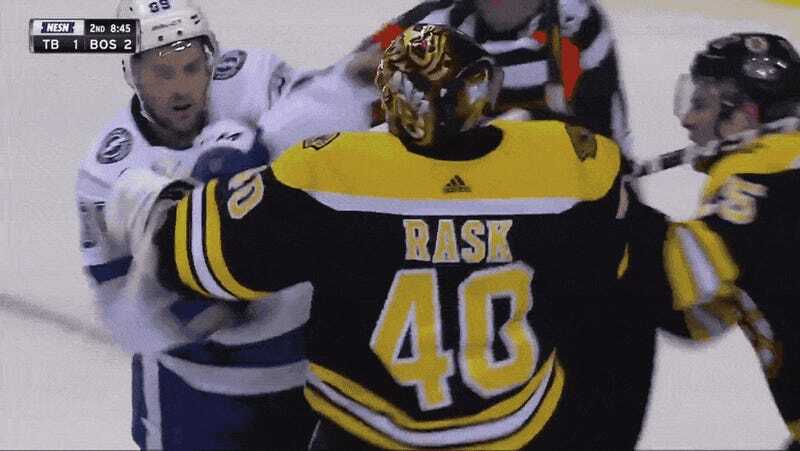 The dust-up started when Tampa Bay’s Cory Conacher slid into the crease along with a Boston defender, knocking Bruins goalie Tuukka Rask off his line. 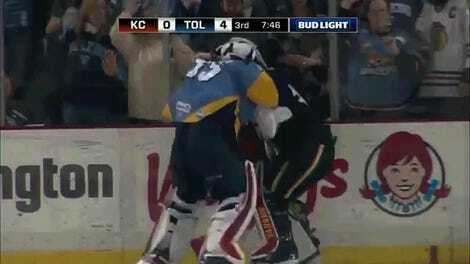 Conacher took a second to get out of the way, and Rask decided to help him along by giving him a couple of shoves. The pair started jabbing at each other even as they got to their feet. Rask only got a few shots in at Conacher, but the real damage was done by the players who came to support their teammates. Conacher was grabbed by Brandon Carlo, who was grabbed by Cedric Paquette, who was grabbed by Nick Holden. Together they all slammed each other down to the ice in a four-car pile-up. Rask was simply led away by a ref. The best part, though, was Lightning goalie Andrei Vasilevskiy taking Rask’s feistiness as a challenge, skating all the way out into his offensive zone only to be held off easily by another official. It was all a good tease of what may be to come.